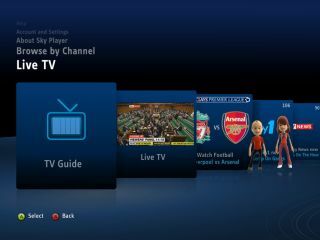 Sky Player for the Xbox is looking increasingly likely to surface in October, with details about the service being offered in the latest Sky subscriber magazine. Although neither Sky nor Microsoft is ready to confirm the arrival of the eagerly awaited application, the latest Sky magazine has opened the Heinz can and made messy with its contents. Obviously for Xbox fans the arrival of the Sky Player is exciting on its own, but it could also bring with it the Facebook and Twitter updates that were shown off at E3 this summer. To be fair to both Sky and Microsoft, they have never been firm about the date that the Sky player would arrive on the Xbox console – beyond saying that it would be this year. The arrival of the social networking functionality is certainly likely to prove popular – whereas the Sky Player will be heavily dependant on pricing. Having missed (by some margin) the beginning of the Premiership season, the offering is perhaps not as exciting as it could have been, but touches like avatar 'party' viewing and chat could yet make the service make an impact.